Vox Luminis' visit to the Wigmore Hall on Tuesday 19 September 2017 was intended to be an exploration of JS Bach's musical ancestry, a selection perhaps of his mental musical furniture with works by two of his relations of the previous generation, Johann Michael Bach and Johann Christoph Bach, plus older contemporaries Philipp Heinrich Erlebach and Dietrich Buxtehude, all finishing with one of JS Bach's earliest cantatas, Christ lag in Todesbanden BWV4. In the event, things were a little more dramatic than that. 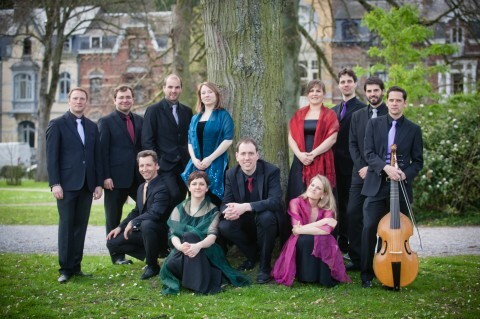 Two days before the concert, the group's artistic director Lionel Meunier developed laryngitis and could not sing. As he directs from within the choir, this caused a problem. Meunier's place in the choir was taken by Jussi Lehtipuu, and the programme went on unchanged, unconducted. To find that your group can manage without you might seem awkward, but it is perhaps the biggest compliment that could be paid to the work of the artistic directer and shows the real collaborative enterprise of the ensemble. Much of the music was centred round Arnstadt in Thuringia, where JS Bach's first employment was and the area where his forbears were based. All the pieces in the programme were for small choir and ensemble, with Vox Luminis using between eight and ten singers from a pool of eleven, accompanied by a small ensemble of violins, violas, violone and organ. We started with a pair of works by Johann Michael Bach (1648-1694), father of JS Bach's first wife Maria Barbara. Herr, der König freuet sich, and Ach bleib bei uns, Herr Jesu Christ. Herr, der König freuet sich set verses from Psalm 21 with lively dancing tuttis alternating with vocal solos, each having two violins weaving round them. The group made a strong sound, creating a vibrant and joyful noise, making the piece rather appealing. Ach bleib bei uns, Herr Jesu Christ started with an instrumental sinfonia with rather spectacular string writing. The piece was expressively plangent, with JM Bach using a lot of vivid word painting, again interleaving solos with tuttis. There was a strong sense of commitment and vibrant communication from both singers and players. Philipp Heinrich Erlebach (1657-1714) wasn't a Bach relation, but he too was based in Thuringia at the court of Rudolstadt where Die Liebe Gottes ist ausgegossen was performed in 1699. It mixes a passage from Romans.V.5 with poetry by the Rudolstadt theologian, Christoph Helm. A plangent piece, full of enlivening detail, it unfolded in quite a leisurely fashion with some notable solos (including a flowing and very present soprano solo) weaving in and out of the tutti sections, and Erlebach created some very appealing textures. Johann Christoph Bach (1642-1703) was Johann Michael's elder brother. His Die Furcht des Herren used a soprano solo and vocal ensemble to explore man's need for wisdom, though evidently the whole is an allegory with the soprano representing Wisdom, and other soloists as the incoming and outgoing members of the council in Gehren where Johann Christoph and Johann Michael both worked. In the event it was a series of expressive verses for soprano solo, each concluding with an ensemble to the words 'Give me wisdom'. The fine soprano solo was accompanied by a richly textured string ensemble, with Johann Christoph creating some quite vivid moments, and the tuttis were vigorous indeed. The first half finished with a second Johann Christoph Bach piece, Herr, wende dich und sei mir gnädig, a dialogue between the tortured soul (three upper voices, soprano, alto and tenor) and Christ (bass solo) with tutti only for the final two verses. The dialogue was in rather expressive arioso, and Christ's responses sometimes turned into small arias. This might have been a sober subject, but much of the detail was lively, and the concluding two verses sung by the whole ensemble were lively with a vigorous final chorale surrounded by elaborate string figuration. JS Bach famously absented himself from his post at Arnstadt to walk to Lubeck to here Dietrich Buxtehude (c1637-1707) playing. Buxtehude's music was far more virtuoso and richly inventive than that of Bach's older contemporaries in Thuringia. We heard Herzlich lieb hab' ich dich, o Herr BuxWV41 ,setting three verses of a 16th century funerary hymn. This opened with the sopranos singing the first verse chorale surrounded by a rich and graceful string accompaniment that developed into something really vibrant. For the remaining verses, Buxtehude wove solos with organ, and ensembles with imaginative string accompaniment into a substantial whole. There was some quite elaborate decoration in the solo lines, whilst the tuttis were quite large scale with some dramatic moments and a really big finish. Again, the piece made me think that I do not know enough of Buxtehude's music. We ended with JS Bach's cantata, Christ lag in Todesbanden BWV4, one of his earliest church cantatas probably dating from 1707 (the year he married Maria Barbara Bach and his final year working in Arnstadt). Here we could hear the influences of Bach's forbears and older contemporaries, the inventiveness of Buxtehude in particular, but there was also Bach's own particular genius, the care for structure and number and the remarkable combination of expressiveness and complexity. The opening sinfonia was quite intense, and the opening verse with its soprano chorale surrounded by a lively texture of strings and voices was engaging and vibrant. Thereafter we had a plangent soprano duet with a moving bass line from the violone which was very expressive, a vibrant tenor solo, a lively central ensemble with a lovely attention to the words, another vibrant solo this time from the bass complemented by a remarkable violone part, and the violone seemed to be almost as prominent as the solos in the following soprano, tenor duet. The final chorale was richly harmonised. This concert was a wonderful exploration of the young JS Bach's mental musical furniture, with the pieces coming alive in engaging and vibrant performances. Perhaps a couple of the works slightly outstayed their welcome, but it was a fine chance to hear music that Bach regarded highly. For an encore were treated to Buxtehude's Jesu, meines Lebens leben, which takes the form of a very appealing chaconne with a sequence of solos and ensembles before the final tutti.